Having a new little one is no easy thing! While it's a precious time, it is an exhausting time. The needs of an infant sometimes seem limitless and add to that the interrupted nights sleep, leaves a mommy needing some good herbal support. Nervines, herbs that support the nervous system, gentle sedatives, and tonic herbs are often needed. Some of my favorite herbs that fall in these categories and are often used postpartum are lemon balm, lavender, chamomile, oat straw (which was discussed in my previous post, as this is also an excellent nutrient herb), motherwort, and ashwagandha. Thankfully, many of these calming soothing effects will pass to your infant via your breast milk. As with all herbs, be sure to check with your practitioner/physician before taking them. Lemon Balm - Truly one of my favorite herbs! I love it's light lemony taste. Not only is this herb a gentle tonic for the nervous system, it is also very uplifting to the mood and emotions. It's calming effects will also pass to your infant. This herb also helps with anxiety and is an anti-viral to boot! With it's bright lemony taste, this is a perfect herb to take in tea form. Lavender - Lavender can be added to tea, but my favorite form of use is the essential oil. Lavender is very soothing and relaxing to the nervous system and a great sleep aide. There are very few essential oils that I use around an infant, as there are very few studies showing safety, but lavender is one that is commonly used. One very easy way to use the oil is to place a drop or two on a cotton ball and place that on your nightstand, next to your bed. The soothing oil will help promote a restful night of sleep. Chamomile - This lovely herb will help to combat anxiety and will help to encourage a restful night of sleep. It also is a digestive aide and will help with gassiness in an infant. Chamomile calms nerves and will help relieve stress. It has so many other benefits, including being an immune booster - it's just a wonderful herb! It's bright apple-like scent is best enjoyed in a tea. Motherwort - This herb is a perfect go to to help ease nervous tension, anxiety, and irritability. It is a bitter herb, so taking it in tincture form would be more pleasant that tea. This is a perfect herb to have on hand, especially right after giving birth, as it is also a uterine tonic and will help with the after-birth cramping and assists the uterus in returning to it's pre-pregnancy size. Ashwagandha - An herb that helps the body adapt to stress, ashwagandha is classified as an adaptogenic herb. It is a gentle tonic that helps to support the adrenal system as well as the immune system. It also has a mild sedative effect on the nervous system and helps to combat anxiety and insomnia. 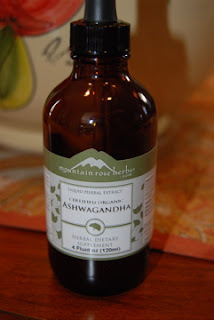 Ashwagandha has a strong taste, so taking it in tincture form would be more palatable than in a tea. 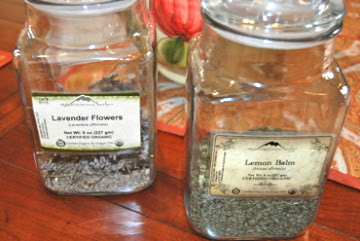 I buy most of my herbs in bulk from Mountain Rose Herbs (link listed on the right side of my blog).